It is worth noting that it is possible to mount solar thermal collectors on a garage, though for maximum system efficiency the distance between collector and water cylinder will need to be kept to a minimum distance. 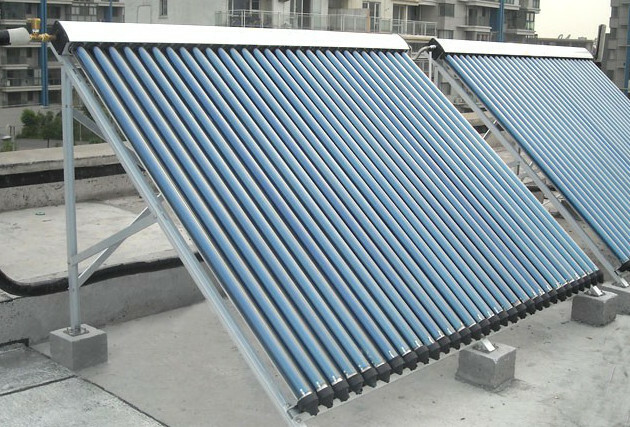 In order for your solar water heating system (solar thermal) to be safe and to function at a high efficiency, it will need to be mounted correctly. The mounting systems are generally designed to suit your requirements, based on location, roof pitch and orientation, whether that is on top of your existing roof tiles, flush with your roof tiles, or on the ground or flat roof area. To get the best results from your panels they should be angled at a 20-50 degree pitch from horizontal and pointed towards the southwest. The standard on roof panel mounting system is constructed of stainless steel brackets that are fitted underneath the solar thermal panels. The brackets are then attached directly to the roof rafters. Rails are then fixed to the brackets which sit directly above the roof and the solar thermal panels are then fixed securely in place on the rails. An in roof solar thermal system is built into the roof of the property. An in roof solar system looks more aesthetically pleasing but is more complex to install so it will incur extra costs. The system uses trays or flashing systems in order to divert water behind the panel. A water barrier is fitted in place first with brackets above, into which the panels are then fixed. 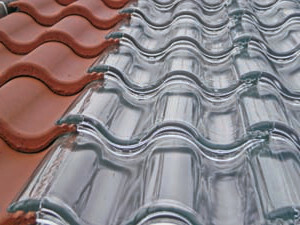 The solar tile system is another form of in-roof mounting with a few key differences. Solar tiles achieve the same stylish aesthetic look as in roof systems but are more suited to new build properties, a re-roofing project or a new extension to the property. However, it is possible to install them on an older property but this may incur extra costs. The reason for this is that the solar tile forms part of the roof covering rather than being fitted to an existing roof structure. 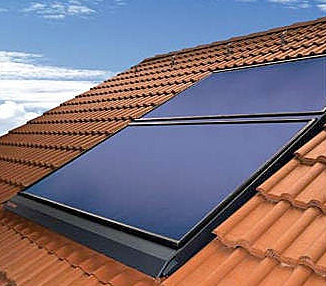 A regular in roof system works by channelling the water behind the panel which differs from solar tiles which allow the water to run over the module. The flat roof solar thermal mounting system is a popular method of mounting the panels to commercial and office buildings, for example. A flat roof mounted system can be orientated in a south facing direction to give optimal performance. There are several different systems and methods that can be utilised with flat roof mounting. The most popular method is to use a free standing mounting surrounded by ballast. Wind loading has to be considered for this type of system to ensure that the location and the structure are suitable. Low ballast systems are available and work by connecting several panels together and lowering the angle of the panel to reduce wind loading. A solar thermal ground mounted system is another popular choice for a commercial setting as well as being a good choice for an agricultural premise or a school. A ground mounted system is installed and operated in much the same way as a flat roof mounted system. The installation can be orientated south to give optimal performance and can be set up with consideration to wind loading. The system itself consists of an A frame which is ballasted with concrete and anchored securely to the ground. Sufficient ballasting and anchoring is vital in order to endure extreme weather conditions. Angled frame mounting and adaptable brackets will allow the system to be angled towards the sun to maximise your system’s potential and collect the most solar heat energy. Both evacuated tube collectors and flat solar collectors can be adapted to maximise their potential through this mounting method. The free-standing, angle framed system is the favoured system for flat roof and ground installations. 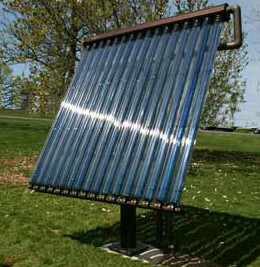 A solar thermal panel / array can be bought with an adaptable, angled frame mounting system attached as a unit, but sold separately as well. 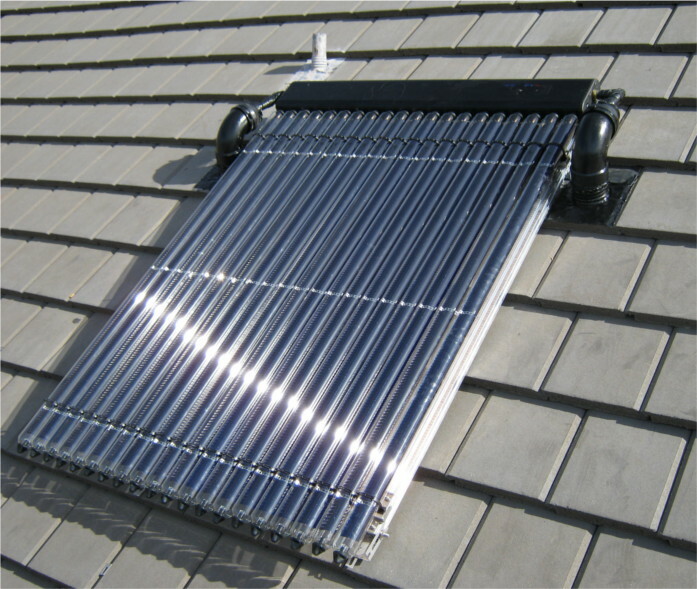 Flush mounting or in-roof mounting systems are where your solar thermal array is built into your roof. This system is usually adopted when installing at the point of the property’s or roof’s construction, but tube evacuator and flat plate collectors can also be mounted this way after the roof’s completion. A lot of install and manufacturing companies will boast a seamless transition between your existing roof and your mounting system. These racking / mounting systems are designed to be permanent and are generally built from high-quality stainless steel to ensure long lasting durability regardless of weather conditions. Ballast mounting systems are used when a roof can’t be penetrated to fix a flush or angled frame mounting system to the solid structure of the roof itself. The system integrates with the angled frame and allows for weighted blocks to anchor the system in place. This mounting method usually allows your solar thermal system a degree of movement and the option to set up and take down your panels when you choose. If you have any questions about solar thermal or solar PV mounting systems then you can use the ‘contact us’ tab on the right to ask a member of our team. Alternatively, you can pose your questions on the Renewable Energy Hub forums where installers and professionals from all over the world can give you their opinions.